2013 October « Peeter Joot's (OLD) Blog. We were presented with a diffraction result, that the intensity can be expressed as the Fourier transform of the aperture. Let’s review a derivation of that based on the Huygens principle. Consider the aperture of fig. 2.1. Note that this the Huygens result is an approximation in many ways. 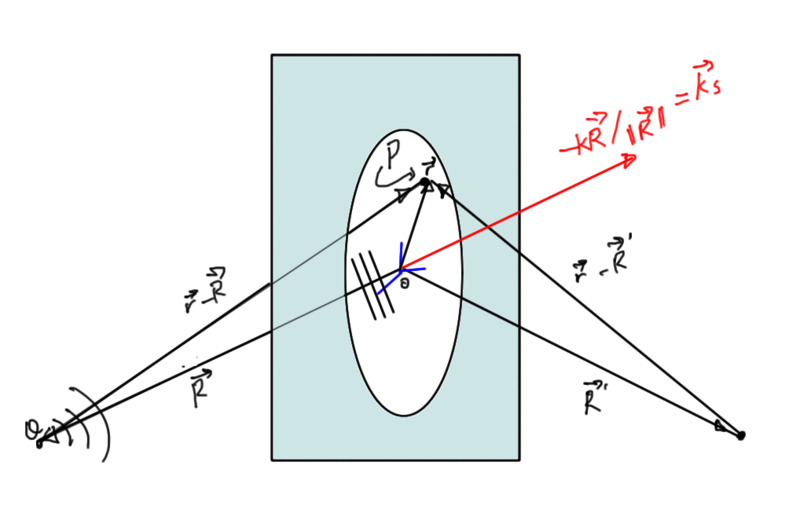 Fresnel later fixed up the proportionality factor and considered the angular dependence of the between the source and diffracted rays (the obliquity factor). That corrected result is known as the Huygens-Fresnel principle. Kirchhoff later considered solutions to the scalar wave equations for the electromagnetic field components and , ignoring the Maxwell coupling of these fields. See section 8.3.1 , section A.2 section 10.4 of , or section 5.2 of  for details. See section 9.8  for a vector diffraction treatment. Let’s proceed with using eq. 2.2 to obtain our result from class. For simplicity, first position the origin in the aperture itself as in fig. 2.2. M. Born and E. Wolf. Principles of optics: electromagnetic theory of propagation, interference and diffraction of light. Cambridge university press, 1980. What is the justification for such a harsh and expensive bylaw? 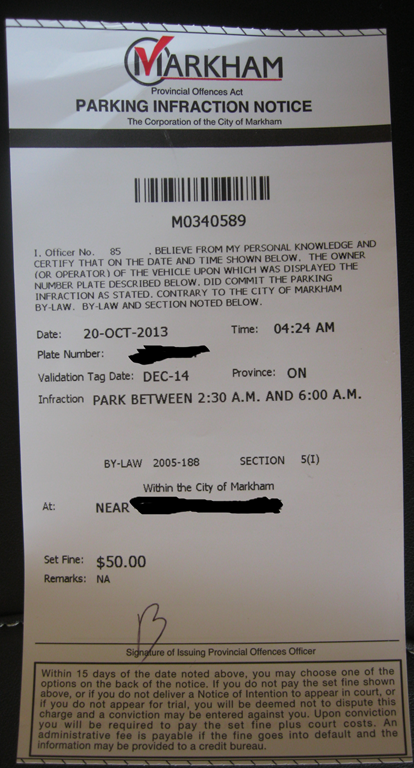 Letter to my Markham council representative, after obtaining an “overnight street parking” ticket. I don’t expect that my city “representation” will be able to change anything, especially since this insanity likely represents a nice revenue stream. I live in the Cornell area, which has parking areas cut into segments of the boulevard for street parking that allow for parking without obstructing any flow of traffic. For some reason there is a by-law that prohibits overnight (2:30 am – 6:00 am) parking in these areas. These cut in segments are considered Markham roads, and included in the generic Markham no-overnight parking laws. In winter months the no overnight parking on roads makes sense. It could obstruct road clearing, and a blanket policy against such parking likely simplifies things. Since the Markham plows clear out these cut out parking segments too, I don’t object to such a policy for the Cornell cut in parking segments in winter too. However, what possible sense does this make in other seasons? Yesterday it was convenient to park in the front of the house, especially since I had intended to go out again afterwards. Plans changed and I ended up forgetting to move my car to the backyard driveway. This was a very expensive memory lapse, and cost me $50! I am fully aware of the web form that allows for occasional use of this parking area (for visitors, driveway maintenance, …) but the penalty for simply forgetting to move the car when plans to go out change, is extremely harsh. Especially when we are parking in an area that does not obstruct flow of traffic and the season isn’t one for which snow plowing is relevant. If nothing else, the penalty for this is exorbitant. I can also imagine that this could potentially be abused. Somebody with multiple vehicles could use such an on street parking area as a personal extension to their driveway. This could introduce fairness issues, preventing other taxpaying neighbours from using a space that should also be available to them. This extreme scenario could easily be resolved without a harsh and default blanket penalty, since there is a complaint mechanism available for parking issues. I can’t help but feel that Markham uses this parking by-law as a revenue source, with no real non-monetary justification. This seems especially true in the Cornell area where there is no obstruction to traffic by these pseudo on-road parking areas. 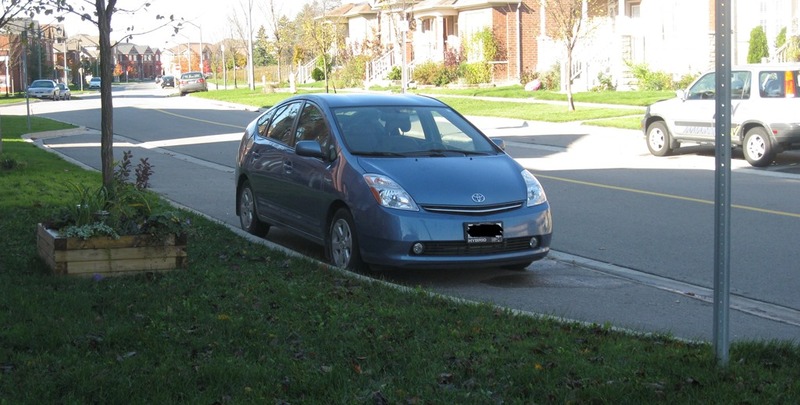 Do we not pay enough in property taxes, that we can’t occasionally park in front of our own houses without oppressive punishment for a failure to move the vehicle to our personal off street parking areas (driveways and garages)? We’re discussing specific forms to systems of coupled linear differential equations, such as a loop of “spring” connected masses (i.e. 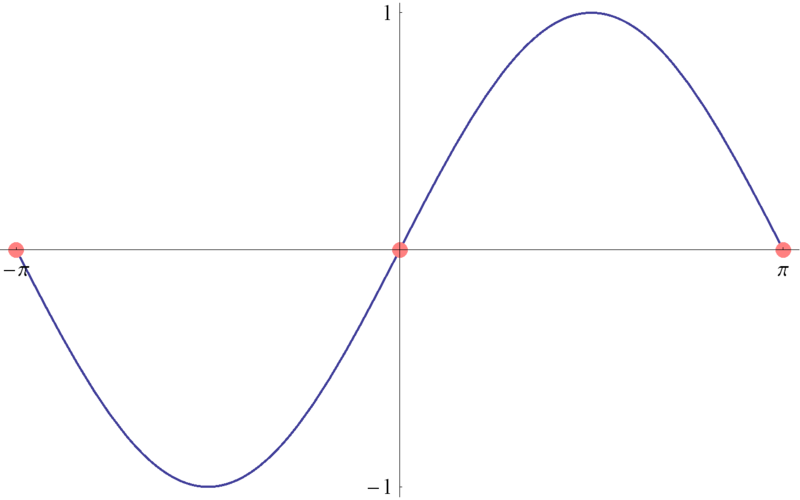 atoms interacting with harmonic oscillator potentials) as sketched in fig. 1.1. Instead of assuming a solution, let’s see how far we can get attacking this problem systematically. Observe that this solution is a general solution to second order constant coefficient linear systems of the form we have in eq. 1.5. However, to make it meaningful we do have the additional computational task of performing an eigensystem decomposition of the matrix . We expect negative eigenvalues that will give us oscillatory solutions (ie: the matrix square roots will have imaginary eigenvalues). We also see, unfortunately that has a zero eigenvalue, so we can’t compute . We’ll have to back and up and start again differently. We see that the zero eigenvalues integration terms have no contribution to the lattice coordinates, since , for all . Eigenvectors for eigenvalues that were degenerate have been explicitly enumerated here, something previously implied. Observe that the dot products of the form have been put into projector operator form to group terms more nicely. The solution can be thought of as a weighted projector operator working as a time evolution operator from the initial state. 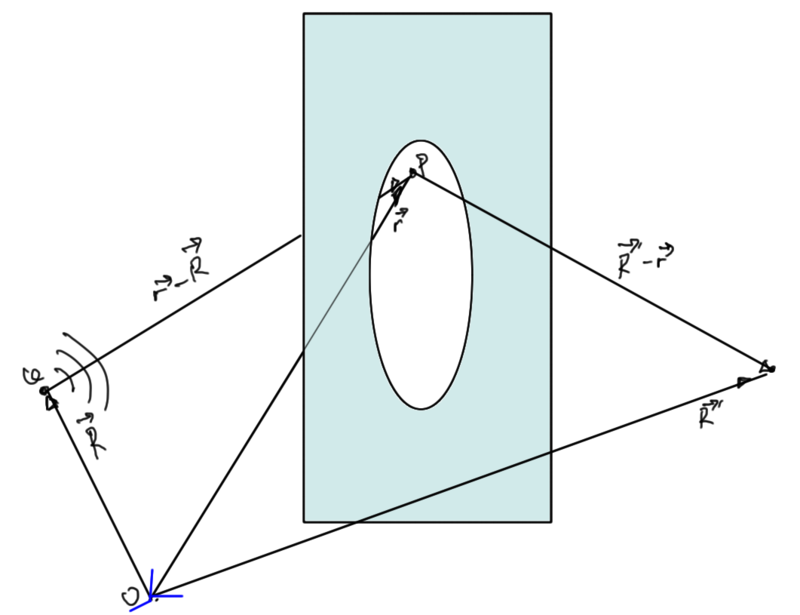 The leading matrix is an orthonormal projector of the initial conditions onto the eigen subspace for . Observe that this is proportional to itself, scaled by the square of the non-zero eigenvalue of . From this we can confirm by inspection that this is a solution to , as desired. We clearly have a constraint that is a function of frequency, but one that has to hold for all time. Let’s transform this constraint to the frequency domain to consider that constraint independent of time. We can verify quickly that this satisfies our harmonic equation . Having applied the transform technique to the very simplest second order system, we can now consider the next more complex system, that of two harmonically interacting masses (i.e. 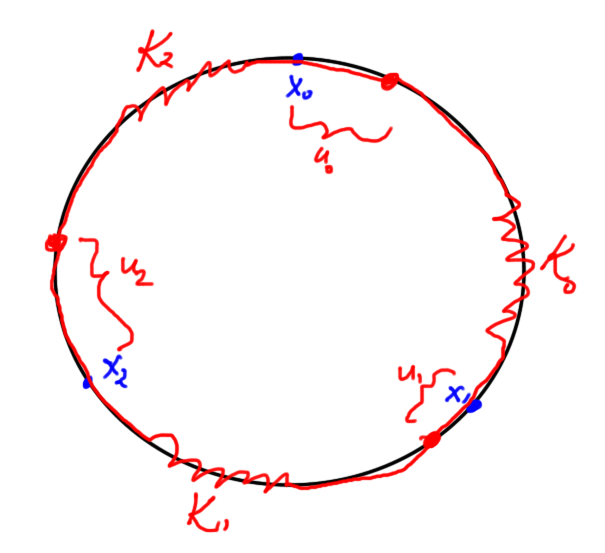 two masses on a frictionless spring). Observe that the constant term is not really of interest, since it represents a constant displacement of both atoms (just a change of coordinates). We assumed exactly this form of solution in class. The trial solution that we used in class factored out a phase shift from of the form of , but that doesn’t change the underling form of that assumed solution. We have however found a good justification for the trial solution we utilized. I have I’d like to express that I do not have any interest in funding an arena that is almost surely to end up as a new financial liability for current and future Markham taxpayers. Given the historical failure of so many public funded arenas at profitability, an extremely convincing case ought to be required for this proposed project. Additionally, all those that are lobbying for the project ought to be publicly identified, since they stand to benefit substantially from the proposed subsidies and hidden future tax incentives. Those supporting those lobbyists in city council also ought to be publicly identified so that a future audit for potential benefits received can be performed. We live in a culture that has a collective case of Alzheimers, so I like to point out that it wasn’t that long ago that Toronto’s Skydome failed spectacularly as an Ontario and city investment, eventually sold again and again at firesale prices until Rogers eventually bought it. As Ontario tax payers, we are surely still paying for interest charges on the debt incurred for this project, despite the fact that it no longer provides any direct source of income to finance that debt. This last points out that the Montreal stadium took three decades to pay off! An arena paid for using Markham city funds and tax benefits, is really an arena that will be paid with taxpayer debt servitude, directly or indirectly. Allowing our council to fall for this sales pitch will mean that we will almost surely end up, like so many other municipalities, playing out the same old pathetic story of padding the pockets of commercial developers at the expense of the residents. For non-Markham residents, here’s a couple stories with some of the background. Also interesting is the survey that can be found on the Markham council website, since it outlines some of the tax shelters that were being provided with the package.